"A metamorphosis from clueless living to intentional living. It creates a desire to live life to its fullest...not wasting a precious moment." is a Denver native, mother of 3 children, Nina to 4 perfect grand babies, keeper of 2 black cats and wrangler of 6 chickens! 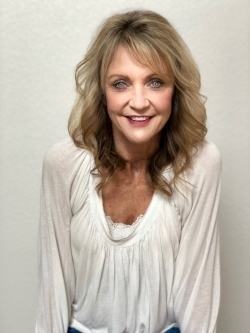 A picture of an ever morphing creature, Michelle has worked in the service industry for 42 years as hair designer, certified permanent make-up artist and massage therapist. Now as a Certified Life Coach professional she combines her years of service experience with her passion as a life learner to coach her clients toward intentional living. If there's one thing she has learned, besides lots of secrets ( people tell their bartender and hair designer everything) that everyone has a story they long to share with someone who will listen and care. It's these stories that made Michelle seek her life coaching certificate. She believes the value of someone feeling confident in themselves and their purpose in this world is priceless! Like many, one of Michelle's biggest life challenges is learning to find the beauty in change/loss. Whether it's a relationship, death of a loved one or just finding the new normal with aging parents and letting them grow old with dignity. Michelle believes these life experiences are transforming in a persons life. "If we can cherish the concept of being a life long learner, every experience we have, regardless of our desire to measure it as a success or failure, becomes a valuable gem in the crown of our lives."